For over 40 years, students from the Department of Hospitality & Tourism Management (HTM) have been organizing HTM Career Day. This event brings recruiters from more than 60 companies to meet with hundreds of students and features a central career fair in the Campus Center Auditorium, individual information sessions hosted by recruiting firms, and a lavish reception and networking event for recruiters and senior students, held in HTM's Marriott Center for Hospitality Management. The HTM Career Day is a student-run, non-profit event that has been held for over 40 years and it is the largest student-run career day on the East Coast. In years past, the event has had tremendous success and continues to grow with now over 60 companies attending annually. The students attending this career day are ambitious to gain industry experience and to network with recruiters in order to achieve their final goal, whether it’s an internship, full-time job, or simply cordial information sharing with recruiters. 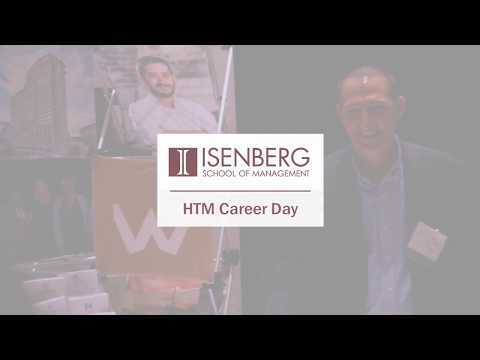 Each year, the HTM Career Day Committee builds upon their existing foundation to make it the best possible experience for the attending recruiters. This event is spread over the course of three days as it includes a Rapid Recruiting night for all sponsors, complimentary breakfast, lunch, and ends with our Senior Reception. Furthermore, rooms are offered for information sessions to be held either before or during the career day, as well as interview rooms and suites for recruiters to host on-campus interviews the following day. The Career Day Committee strives to meet each company’s individual needs and truly looks forward to providing each company with a personalized and unsurpassed experience while joining us on campus. For more detailed information, including prices and sponsorship information for attending companies, please download a copy of our Prospectus below. The HTM program and the Isenberg School of Management at UMass Amherst is consistently ranked as one of the best in the country. For 2019, U.S. News & World Report ranks the Isenberg School of Management the #1 Public Business School in the Northeast, #26 among public schools in the country, and #44 nationwide among all business schools. Additionally, BusinessWeek ranked Isenberg in the Top 10% (7th) for “Recruiter Satisfaction” among all public universities. This continual accomplishment greatly contributes to what makes our program stand apart from other universities. The satisfaction that recruiters find with Isenberg students is evidence of successful placement and we are excited for you to experience it with us this year. 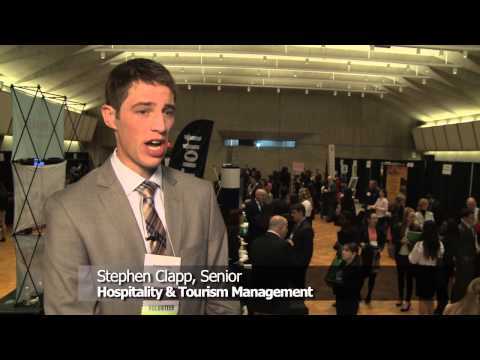 Our Career Day is a unique occasion for your company to recruit from an elite selection of students at UMass Amherst. In addition to your booth exhibit during the career day, we offer complimentary use of our facilities to conduct information sessions. These sessions offer you the ability to meet students directly, and inform them about the available positions your company has to offer. We are now offering a Rapid Recruiting option the evening before Career Day in order to maximize the exposure between students and recruiters. As a diverse community of students, we thrive by working in a variety of sectors within the hospitality industry. With the range of concentrations available to students, including hotels, casinos, conventions, tourism policy and planning, and food and beverage, your company is sure to find the perfect candidate for the job. We invite all sponsors to participate in our unique Rapid Recruiting setting that we hope to be fun, lively, and time efficient. This method will allow each company to promote, educate and hire during the recruiting season. This event will take place the evening before Career Day. The evening will allow you to quickly pitch your company and break the ice with small groups of students who rotate from recruiter to recruiter station. Hosting an information session is a great way to educate students about your company and promote employment opportunities your company may offer. Information sessions provide a personal environment and are ways to create long lasting professional relationships with students. Information sessions are complimentary, and can be requested during your registration. The annual Senior Reception is the Hospitality & Tourism Management Department’s premier networking event, hosted to enhance interaction amongst our seniors, recruiters, faculty and alumni. Boasting a relaxed, yet sophisticated environment, the Senior Reception is a time where recruiters can come and get to know our graduating students on a personal level and celebrate all of their accomplishments. Interview rooms, conveniently located on campus, will be available for the following days on February 27th and 28th. We welcome you to take advantage of our facilities here at UMass. Interview rooms are complimentary and can be requested in the Registration Questionnaire. Watch these videos on what students suggest you should do to prepare for Career Day. Also visit the Chase Career Center for more tips. Get more tips to prepare for Career Day at the Chase Career Center. Career ResourcesView a complete list of downloadable career guides.